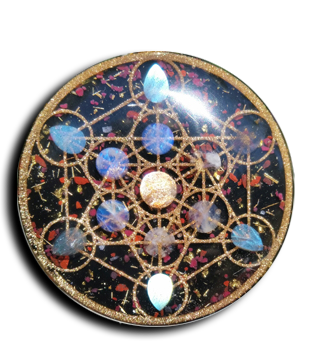 This charging plate is made with a gold leaf and glow cast of a very precise Metatron Cube design. It is inlaid with Malachite and brass shavings. Smooth front and back. The body is made with Steel shavings and 13 aligned double terminated quartz crystals. Metatron’s cube is created by drawing the 13 Spheres of the Flower of Life and then connecting the center of each sphere together with a line. It represents anything and everything that can be created in the physical universe. This image shows us all five of the Platonic Solids in its geometry, the building blocks of all matter. The geometry in this plate is cast with Gold Leaf and Glow Powder. Under the cube design, within each of the 13 Spheres, is a double terminated Tibetan Quartz Crystal. The cube geometry in this plate is cast with gold leaf and glow powder. The entire geometry of the Metatron cube here is shown (no cut corners!). A marvel to view and hold and one of the most difficult casts we preform.